T&F Plast Trade Sp. z o.o. is a trade company operating at the market since 1995 as a supplier of know-how, machinery and equipment for plastics processing, mainly in the sector of flexible packaging materials. We supply complete lines for film extrusion, flexo and rotogravure printing presses, laminating and coating machines, slitter-rewinders, bag making machines as well as lines and equipment for washing and recycling of plastic waste material. Furthermore we supply accessories and spare parts for the above mentioned machines. Our offer takes over new machines manufactured by some Italian producers which we represent on the Polish market, as well second hand machines and devices. We give our Customers possibility to buy the machines with dismantle, assembly and start up services. On request, we may arrange all the formalities of import procedure regarding the machine of your interest. In case You don’t find in our offer the machine of your interest, please do not hesitate to contact us, and we will try to find a machine which will meet your expectations. approaching device to the counter pressure roll (one of the rolls of your film line) powered by pneumatic cylinders;micrometrical adjustment by means of knobs, to adjust the printing pressure. 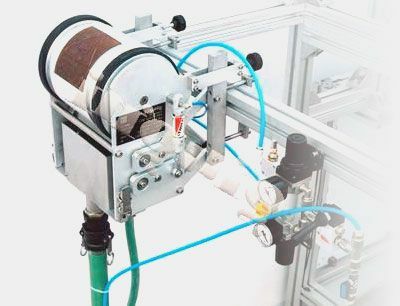 complete with ink feeding and return system (supplied with hoses, fast connections, ink filter), and 15 or 25 litres ink bucket.